Here are six concise three-movement concertos in chronological sequence. Across five decades the composer encompasses a broad range of moods and poetry. The confidence of the works of the 1940s and 1950s contrasts with the bleak intimations that gatecrash the works of the 1970s and 1980s. This disc is a rebadged version of EMI Studio CDM 7 63491 2 from 1990 now long gone to the deleters in the sky. The recordings were originally derived from a couple of EMI Arnold LPs and it�s perhaps worth a few moments of black disc archaeology before we get into the review proper. The first of the two LPs is an analogue original: ASD 3868 with the two flute concertos, the Serenade and the Sinfonietta No. 3. The second derives from early digital sessions issued on LP in 1984, the year after the tentative launch of the CD in the UK. The catalogue number is EL 27 0264 and covers the remainder of the concertos on the current CD. Intriguingly, in 1978 the American flautist John Solum was the soloist in the same two flute concertos plus the first two Sinfoniettas. His orchestra was the Philharmonia and the conductor was Neville Dilkes. That EMI vinyl was ASD 3487; it was one of those hybrid stereo/quadraphonic discs. I have never understood why the Solum flute concertos were disdained and why within two years Adeney was in the studio remaking the flute concertos. The original Dilkes/Solum LP has survived only in relation to the two Sinfoniettas which found their way onto EMI CLASSICS CDZ 5 74780 2 review . Was there something wrong with those Solum sessions? Did the composer object? Were there contractual problems? Who knows? In any event there is clearly glowing value in having the Adeney recordings as he was the dedicatee, first performer and principal flute in the LPO in which Arnold played. Has any clarinettist produced such an engagingly whoozy lilt as that delivered by Janet Hilton (not Jane Hilton as claimed on the rear cover) in the first movement of the Clarinet Concerto No. 1? Perhaps Adeney challenges her in the finale of the first flute concerto. In the Clarinet Concerto, after a first movement that offers evidence of Arnold's film music successes the second and the almost grafted-on perfunctory finale, are more severe and querulous. Although Arnold was no fashion-submissive this severity was in line with what was expected at the Edinburgh Festival where the Clarinet Concerto was premiered by its dedicatee, Frederick Thurston. The Oboe Concerto is a personal favourite and was part of the highway that lead me to enthusiasm for Arnold. While Donald Hunt takes things a tad more quickly than I prefer this is a lovely reading where the accent is on lilting urgency. Menace stalks the singing pages of the central vivace with its echoes of the First Symphony. Fascinating how the finale sounds astonishingly and very briefly similar to the opening bars of the finale of the Finzi Clarinet Concerto premiered months earlier at the Three Choirs. This movement epitomises the singing greatness of Arnold with its longing, poignancy, searching grace and directness. It was written for, dedicated to and premiered by Leon Goossens. Superficial similarities include Nielsen, Rodrigo and even Binge! The ripely recorded Horn Concerto No. 2 was a vehicle for the poetry and virtuosity of Dennis Brain who died in a car accident shortly after the premiere at the 1957 Cheltenham Festival. The andantino grazioso as heard here does have echoes of Gymnopédie No. 1 although it is pressed forward with more speed than the Satie standard. Norman Del Mar - a horn-player in his time - here conducts. The solo is taken by Dennis Brain's friend, Alan Civil. The Flute Concerto No. 1 is distinguished by its mordant dissonances contrasted with a singing solo line and a central andante of aspiring romanticism. 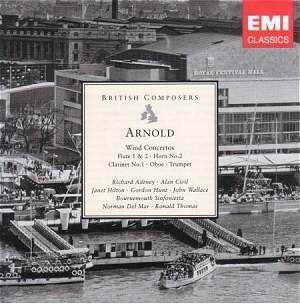 It is fascinating that Arnold's Flute Concerto No. 2 was premiered at the Aldeburgh Festival; not exactly standard Britten-compliant fare. It's a shade darker than the first concerto so less of a troubadour but the singing seam is still there as if the years of the Oboe Concerto were glimpsed darkly. There's also a dark dancer pirouetting through the Vivace. Balletic graces also come to the fore in the finale almost as much as in the second movement of George Lloyd's Fourth Symphony heard recently in Manchester with Rumon Gamba and the BBCPO. John Wallace's Trumpet Concerto reminds me of the Cornish Dances and of the roughly contemporaneous finale of the Eighth Symphony. There is however a Handelian heaviness in the sinews which is shed for the flighty staccato adrenaline of the finale. This is the shortest of six concertos - all over and done with in eight minutes. I wonder if EMI will be producing their own Arnold Memorial Edition. In addition to these concertos the company has fine versions of symphonies 1, 2 and 5 as well as the three Sinfoniettas, the Serenade and various sets of dances and overtures. The intrinsic attractions of this issue are enhanced by its complementary virtues now that we have volume 2 of the Decca Arnold Edition 4765343. That four CD set of seventeen of the concertos omits the concertos for oboe and trumpet so this disc is attractive as an invaluable supplement. A splendidly balanced and recorded single disc collection presenting most of the many facets of Malcolm Arnold.